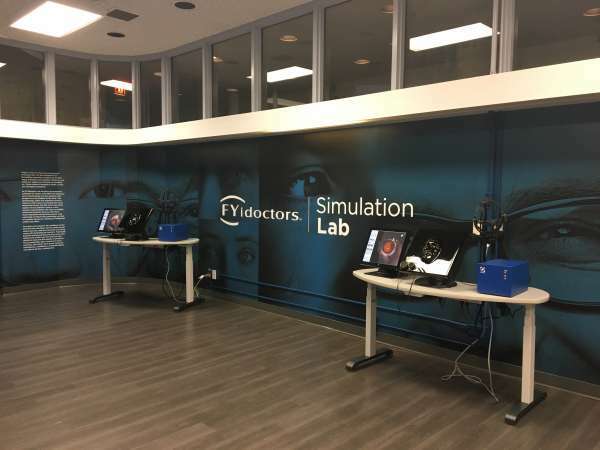 The University of Waterloo’s School of Optometry and Vision Science and national eye care provider FYidoctors are thrilled to announce the launch of the FYidoctors Simulation Lab – the first optometry lab of its kind in Canada. The new lab, funded in part through an $800,000 investment from FYidoctors, is the largest single sponsorship in the School’s history, and will change the way optometry students in Canada are educated. With a total cost of $1.5 million, the new lab offers state-of-the-art equipment that simulates a patient’s eye, providing students with an opportunity to practice diagnosing vision problems and eye diseases. "With the simulators, optometry students are enabled to practice and master skills as they progress through increasingly complex training modules. This additional lab time will allow students to build the foundational skills required for our faculty to take the students from good to great," said Dr. Stanley Woo, Director of the School of Optometry and Vision Science. The simulation equipment will supplement real-life training and will also provide hundreds of real patient cases which will help students to recognize, identify and diagnose eye and systemic disease more quickly and confidently. Dr. Al Ulsifer, CEO and Chairman of FYidoctors and Waterloo alumnus, said that this investment isn’t just an investment in the University, but an investment in the future generation of optometrists. "When we formed FYidoctors 10 years ago, we created it with a vision to enhance the lives of people, in our communities, and across the world. Investing in students, and in their clinical education, will ultimately enhance patient care in the communities in which we serve, and keep Canada on the forefront of optometry and vision science," said Dr. Ulsifer. “Simulation technology is the future of health care learning and is directly aligned with FYidoctors’ spirit of harnessing innovation to help our patients lead more fulfilling lives,” Dr. Ulsifer concluded. Dr. Ulsifer led the formation of FYidoctors in 2008 with a dynamic group of University of Waterloo optometry grads who had a vision to create a national organization of optometrist-led eye care clinics. Today, FYidoctors is the world’s largest optometrist owned eyecare company, and invests heavily in technology to ensure its clinics deliver exceptional care to their patients. The University of Waterloo is one of only two optometry schools in Canada, making it a national resource for training vision care professionals and vision science researchers. The lab will initially include 5 Eyesi® Bionocular Indirect Opthalmoscopes (BIO) are a state-of-the-art augmented reality simulator for training of retinal examinations and provides a highly realistic and dynamic 3D simulation of the anatomical structures of the eye and ophthalmoscope optics. Phase two of the lab will be unveiled at a later date and include the addition of the Eyesi® Slit Lamp simulators. This technology will allow students to practice basic handling of the device and skills required to conduct a corneal exam, retinal exam and Gonioscopy & Tonometry. Through multi-tiered training provided by the Slit Lamp simulation technology, it will promote pattern recognition for retinal pathologies and provide competency-based assessments. With Eyesi® BIO and Slit Lamp technology students can examine a wide range of clinically relevant cases before they meet their first real patient. The simulated cases are based on real patient histories and were developed in cooperation with universities and eye specialists. Simulation technology provides an authentic experience that provides the look and feel for the diagnostic skills of BIO and slit lamp examination. Students can practice as much as they need to reach certain milestones in a modular system that progresses in difficulty and complexity. The process begins with mastering the technical skills to image the fundus, and later incorporates real cases and images for examination and diagnosis. The goal is to use precious laboratory time with faculty to transition students from good foundational skills to great diagnostic skills.